My mom, Gloria, is a terrific home-cook. 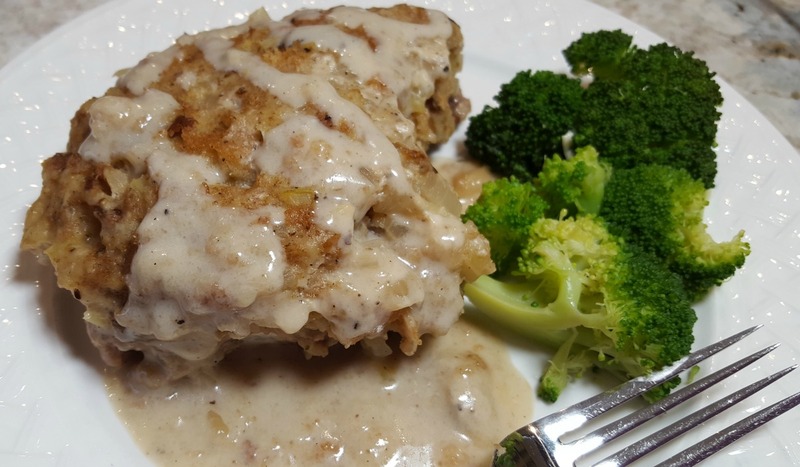 Her stuffed baked pork chops recipe is a favorite with our family, especially my sons. I really haven't made it much over the years because it never seemed to turn out as tasty as Mom's. One time when Mom made this dish for me and I commented that I just couldn't make my stuffed pork chops taste as good as her's. As she ran down the recipe I realized I consistently omitted two critical ingredients. There should have been applesauce in the stuffing and the white wine in the sauce. Mom had never told me about these secret ingredients. They make all the difference in the world! 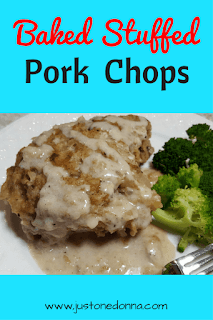 This pork chops recipe is easy to make and a perfect comfort food for autumn and winter dinners. I'll often prepare the dish a day ahead and then bake it the next day. That makes this a great dish for you to prepare on the weekend for cooking early in the week. It will take an hour to bake, so you'll want to plan ahead to allow for that. When I have the time, I'll make my own applesauce to add to the stuffing and then to serve on the side. If you haven't made your own applesauce before, you should start. Homemade applesauce is easy and so much tastier than jarred sauce. The part of this recipe that makes this dish special is the simple sauce made from the cream of mushroom soup mixed with a little white wine. 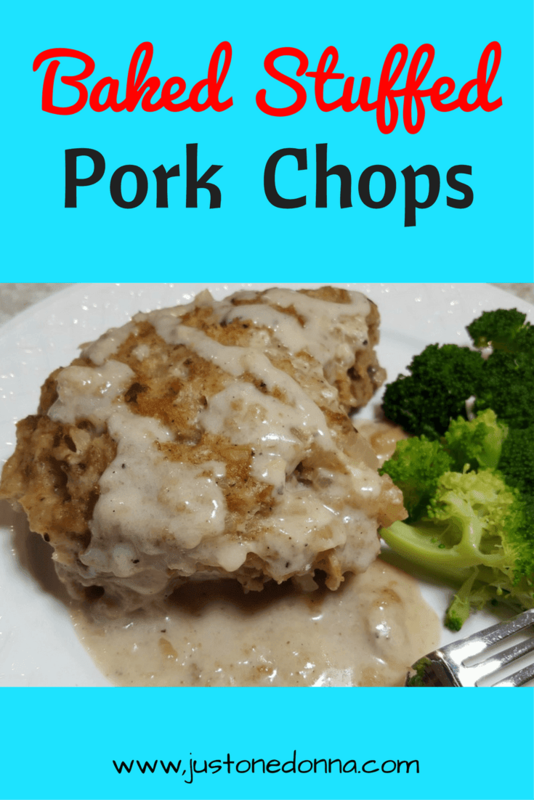 The pork chops will cook in this sauce which keeps the chops nice and moist. Spoon a little of the sauce over the chops before serving them for a little extra flavor. Heat the butter and oil together over medium-high heat. Season the pork chops with salt and pepper. Brown both sides of the pork chops and then remove them from the pan. To the same pan, add the onion and celery. Saute vegetables 3-5 minutes until soft and translucent. Add the seasoned stuffing mix, chicken broth, and applesauce. Stir to combine and taste for seasoning. Remove the pan from the heat. Mix together the mushroom soup and white wine. You can skip the wine, but it will make a difference in the end result. Trust me! Place the pork chops in a baking dish and pour the sauce around the chops. Spoon the stuffing mix on top of the pork chops. Cover tightly with aluminum foil and bake for 60 minutes, until the pork chops are cooked through and the sauce is bubbly. Serve with your favorite vegetable and watch your family gobble it all up! Here's my homemade applesauce post. Hi Donna the "Printer Friendly Recipe" button is not working? Oops! Thanks for letting me know the Printer Friendly button wasn't working. Every once in while there is a technical issue that slips by me. Thanks for your help! Your pork chops sounds delicious.